Mention the name Helmut Brinkmann to an audiophile and the first thing that comes to mind is probably the German designer’s superb turntables. But Brinkmann began his audio career more than 35 years ago making amplifiers, and even designed his first DAC way back in 1986 (called the “Zenith”). Now Brinkmann has come full circle with the new Nyquist DAC, a product that is designed and built with the same fanatical attention to detail as the company’s turntables. 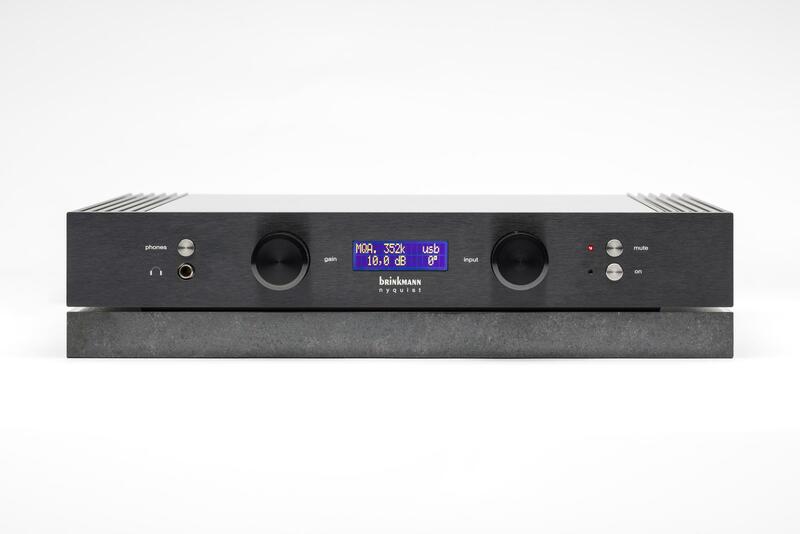 Moreover, the Nyquist is brimming with advanced features, including MQA decoding, high-speed DSD support, Roon-ready operation, UPnP connectivity, and upgradeable digital circuitry. Yet for all its cutting-edge digital prowess, the Nyquist’s output stage is built around that most ancient and venerable of audio technologies, the vacuum tube. The product of a recently expanded digital-design team, the Nyquist is a three-component affair: the DAC itself, the 24-pound granite base on which it rests, and the outboard power supply. In Brinkmann tradition, the granite base isolates the DAC from vibration. Four vacuum tubes are mounted horizontally outside the chassis (two on each side), but encased in large fins that resemble heatsinks. The front panel offers three buttons, two knobs, a headphone jack, and a comprehensive display. The latter indicates the incoming signal’s format and sampling frequency, output level, and whether phase inversion has been engaged. The display also shows when the Nyquist is decoding an MQA file. A period after the MQA initialism indicates “MQA Studio” mode—files that have been auditioned and approved, in MQA format, by the artist, producer, or record-company representative. The left knob adjusts the analog output signal’s level (limited to a range of 10dB for the line output, but with a full range of level control when the headphone output is engaged), and the right knob selects the digital input. Volume, input select, and phase inversion are available on the supplied remote control. Balanced and unbalanced analog outputs are offered on the rear panel. The Nyquist is supplied with a Brinkmann-designed AC power cord. Brinkmann recommends connecting the AC cord directly to the wall outlet rather than through a power conditioner. The Nyquist is fully up to date with the latest in streaming technology and connectivity. In addition to decoding any PCM sample rate up to 384kHz, it is DSD compatible all the way up to DSD256 (four times the standard DSD rate). An Ethernet port provides network connectivity, allowing you to stream music from any UPnP (Universal Plug ’n’ Play—some wags call it “Universal Plug ’n’ Pray”) device. Some NAS drives incorporate an integral UPnP server, which obviates the need for a PC or Mac. If you want to use a computer with the Nyquist, you can configure most music-playback software programs to operate as a UPnP server. The Nyquist is a Roon-certified endpoint, allowing you to stream from any Roon core server on the network to the Nyquist via Roon’s superb interface. The Nyquist supports Tidal, Deezer, and vTuner Internet Radio. Brinkmann was one of the first companies to embrace MQA, the format for delivering high-resolution music via streaming services. MQA is much more than a convenient distribution system; the format fundamentally rethinks the entire digital encoding-transmission-decoding chain and employs radically new technology to overcome sonic and technical limitations inherent in traditional digital audio. It’s a bit ironic that the DAC is named after Harry Nyquist, the Bell Labs engineer who formulated, in the 1920s, many of the concepts upon which digital audio is based (including the famous “Nyquist Theorem” that states that a digital-encoding system’s sample frequency must be at least twice as high as the highest signal frequency to be sampled). I say it’s ironic because MQA overthrows some of Nyquist’s ideas in favor of a more sophisticated analysis. Fundamental “laws” of digital audio, once thought to be inviolable, have fallen in much the same way that Newtonian physics was upended by quantum mechanics. Brinkmann is awfully proud of the Nyquist’s build-quality judging from the see-through top cover. Indeed, the layout, parts-quality, and design are exemplary—a model of meticulous engineering. The outboard power supply sends regulated DC to the Nyquist where it is further regulated next to the circuits supplied. The digital module alone incorporates 11 separate power-supply regulation stages. The Nyquist is built around the ESS ES9018S Sabre DAC, one for each channel. Each 9018 DAC incorporates eight separate digital-to-analog converters; their outputs are combined to lower the noise floor, randomize any conversion errors, and create a balanced output signal. Brinkmann uses only the DAC portion of the Sabre chip, ignoring its integral PLL and upsampling digital filters. Rather than use these compromised sub-systems, the Nyquist has a separate Brinkmann-designed PLL and re-clocking circuit to reduce jitter. The clock is said to have very low phase noise, and is located right next to the DAC chip (the point where jitter matters). Similarly, the digital filter is implemented in a separate DSP chip running Brinkmann’s custom filter software. This filter upsamples all incoming PCM data to 352kHz or 384kHz for conversion to analog. Sources at 44.1kHz or multiples of that rate (88.2kHz, 176.4kHz) are upsampled to 352kHz; sources at 48kHz or multiples of that rate (96kHz or 192kHz) are upsampled to 384kHz. This dual-frequency scheme avoids sonically degrading non-integer upsampling. Interestingly, the 3.3V that supplies the ES9018S DAC chip is derived from the 160V rail that supplies the tubes. Brinkmann found that this supply technique improved the sound compared with powering the DAC chip from a conventional supply. This description is of the signal path when decoding PCM sources. Commendably, the Nyquist features a completely independent signal path and data conversion for DSD signals. Unlike most DACs that convert DSD to PCM, the Nyquist features a dedicated DSD DAC. Moreover, this DAC is fully discrete and of Brinkmann’s own design rather than an off-the-shelf chip. The DSD signal path includes a very gentle analog output filter. I’ve heard only two DSD DACs with a discrete DSD converter (the Nyquist and the T+A PDP 3000 HV) and can say that they are significantly better sounding than chip-based converters.